Does your organization have an upcoming event of interest to whistleblowers? Contact us to have it included on our Special Events page. This is the Washington, D.C. premiere of the film about the Madoff scandal and the whistleblower who tried to expose it. The President of the National Whistleblowers Center, Michael D. Kohn, will give an informative talk after the film, describing new developments in whistleblower protection. A question and answer session follows the talk. Location: E Street Cinema, 555 11th Street, NW, Washington, D.C. Click on the link for more information. A panel debate: Life After WikiLeaks: Who Won the Information War? A panel debate with Julian Assange’s Attorney, Mark Stephens; Investigative Journalist & Security Services Expert Andrei Soldatov; Emily Bell, Director, Tow Center for Digital Journalism; Washington Post columnist, Richard Cohen; and John Kampfner, Chief Executive, Index on Censorship (Event Chairman). Attendance is free, but space is limited. To secure your place, register here. Over the next few days, the Project on Government Oversight and the DC Labor FilmFest are holding a whistleblower film fest at the American Film Institute’s (AFI) Silver Theater. Located at 8633 Colesville Road in Silver Spring, Maryland, the theater is an easy walk from the Silver Spring metro (and worth a trip itself). Stick around after the film and you will be treated to a discussion of the film by live whistleblowers. The Informant! will be shown Monday, October 18, at 7 p.m. Fair Game will be shown on October 19, at 7 p.m. For more details, call Abby Evans (of POGO) at (202) 347-1122 or visit the POGO website. General admission is $10 for The Informant! : $10 ($8.50 for AFI Members; $9 for Seniors (65+), Students (with valid ID), and Military). General admission for Fair Game, including a discussion with director Doug Liman, Valerie Plame and Joe Wilson, is $20. Tickets can be purchased online at the following links for The Informant and Fair Game. 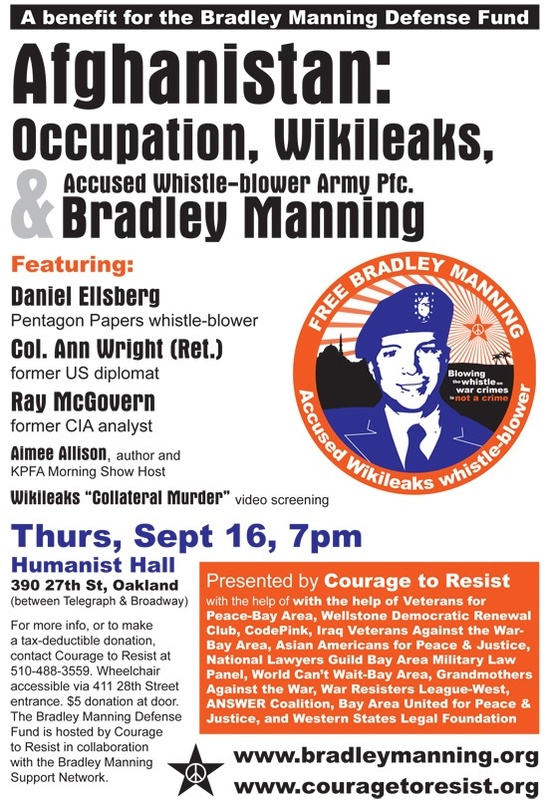 A benefit to raise funds for the legal defense of accused WikiLeaks whistleblower Bradley Manning’s will be held at 7 pm, at Humanist Hall in Oakland, California (390 27th Street). Daniel Ellsberg, Col. Ann Wright and Ray McGovern are scheduled to appear. Additional events, including “whistleblower parties” are scheduled in a number of cities for September 16-19 in connection with International Days of Action in Solidarity with Bradley Manning.